A koi pond is a small pool of standing water that frequently attracts insects. 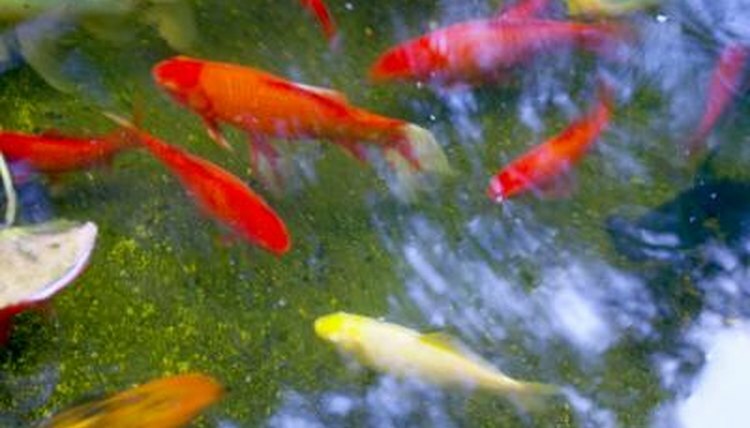 Koi ponds provide a safe and healthy place to raise fish. It is also a tranquil setting for a variety of different landscapes. Koi ponds usually have filtration systems that mechanically skim, drain and filter debris from the pond. The standing water in ponds attracts mosquitoes that are seeking breeding grounds. Mosquitoes lay their eggs in the standing water. Within about two days the eggs hatch and the larval stage begins. During this stage mosquito larvae wiggle throughout the pond feeding on algae and organisms in the water. The larval stage lasts one week, before larvae transition into pupae, where they develop into an adult mosquito. The pupa splits open as the adult mosquito emerges from the pupal case. Dragonflies release eggs into standing or slow-moving water. Eggs are laid directly into the water with a jelly-like, textured substance surrounding the eggs, providing protection from the elements. Larva development can take one or two years, depending on the climate. Warmer waters accelerate development, while cool climates slow it down. Larvae have wing sheaths, a hinged jaw, six legs and the ability to breath under water. Adult dragonflies emerge, know as tenerales, having a pale green tone to their bodies. As they age, the color of the dragonfly gets darker. The female water beetle lays about 600 eggs per batch. The eggs are released into aquatic plant stems, sometimes causing the female to slice the stem of the plant to make room for the eggs. The eggs develop into larvae, which are aggressive predators within the water. Larvae has long sickle jaws that are used to retrieve fluid out of their prey. The water beetle crawls out of the water before the pupal stage begins, forming a cell in damp soil located closely to the original pond or water source where it hatched. During the pupal stage the beetle develops into an adult. The adult beetle emerges from the damp cell and returns to the water. The process from egg to adult takes up to two months. Female water scorpions lay eggs in aquatic plants that are submerged in pond water. At times, an egg can be located close to the water surface, it then uses two small horns to breathe, by positioning the horns to extend out of the water, coming from the egg. Completely submerged eggs, carry out gas exchange through a membranous network. Eggs hatch during the summer months. The young mature into adults after five molting cycles. Water scorpions feed on small fish, tadpoles and invertebrates located within ponds and other still waters. Based in Miami, Shellie Alyssa has been writing articles since 2011. Her articles have appeared on a variety of popular and informative pet websites including munch.zone. In 2000, she was awarded an editors choice award for Outstanding Achievement in Poetry from the International Library of Poetry. She holds a fashion merchandising diploma from Penn Foster College. What Is the Habitat of a Fried Egg Jellyfish? How Long Does a Female Frog Keep Eggs Inside Her Body? How Do Lobsters Get Oxygen? What Are Some Examples of True Bugs? Do Salamanders Live on Land But Come Back to the Water to Lay Their Eggs? How Can I Get Humidity for Hatching Chicken Eggs?